I have a few Citizen watches in my collection now and this one is a very nice addition. Very clear, nice weight, renowned accuracy and of course none of that needing a battery nonsense. The strap is a little creaky but I know that will go after a while. Overall a fantastic timepiece and I would through recommend it! I have had this watch a week and it is brilliant. When it arrived the battery was dead, after reading some of the reviews I took advice and let it to charge on my window ledge while I was at work and when I got home it had charged itself and was working perfectly. The design of the watch is impressive and it looks great. It is very simple to use and I found the instructions easy to understand. I would highly recommend this watch. Just received this watch and very impressed with it. Looks great and also performs very well. Was worried at the start as when I first unboxed the watch the dial was not functioning. After exposing it to half a day of sunlight the watch dial set the correct time itself with the radio function, so all seems well so far! Stylish leather watch with a great chronograph face. Charged up after 4 hrs in daylight and works beautifully. Watch is big but not overly huge and light to wear. Instructions to set up calender and time zone is a little confusing at first but works great when its all set up. I had been looking at much more expensive watches and then saw this one. The style and functionality was similar and at an attractive price. As you will know the watch is solar powered and took only a couple of hours in the sunshine to fully charge. It does take a little bit of reading of the instruction booklet which came in the nice presentation box to get a hang of setting the watch up with the time and date etc, but overall it was a simple process. Whilst slightly larger than the watch it is replacing, it sits comfortably on my wrist. Overall very pleased with the purchase and looking forward to many years of time keeping. 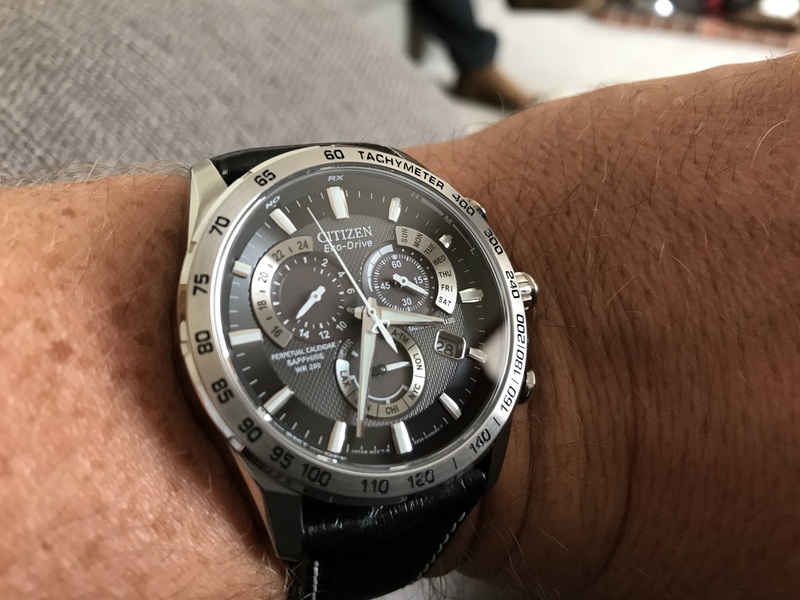 I chose this version of the Citizen Perpetual Calendar as the leather strap gives a more classic look compared to the steel bracelet versions and it works well with the very detailed watch-face that makes it look like higher-end chronograph. \r\nEven if there’s so much information being displayed, the time, date and other functions are still very legible at a glance. \r\nI own other Citizen watches and they haven’t let me down, even after ten years. \r\nThis one has premium materials rarely used in this price range, like sapphire glass and a good quality genuine leather strap it’s also certified 200m water resistant. With all the functions packed into this watch, it seems hard to ask for more.\r\nI’ve been wearing the watch for a couple of weeks now, long enough to review all its functions in details.\r\nCALENDAR\r\nThe perpetual calendar it’s a feature that usually belongs to luxury mechanical watches and it’s one of the reasons why I bought this watch. \r\nUnfortunately, it doesn’t show neither the year nor the month and it’s just limited to the day and date. \r\nEven so, being a perpetual calendar means you’ll never have to set the date again until you die, or the year 2099, whichever comes first.\r\nCHRONOGRAPH\r\nThe chronograph is one of the functions I use the most on a watch. \r\nUnfortunately, on this watch its operation is not straightforward: you must pull out the crown and set it to CHR, only then you can start, pause and stop the chronograph. \r\nIf you leave the watch on the chronograph functionality, the calendar won’t tell you what day it is as the same little hand that keeps the seconds also points to the days of the week.\r\nALARM\r\nThe alarm is an unusual feature to have on an analogue watch, but given the complexity of this watch movement I’m not surprised it’s been included. \r\nIt’s a bit tricky to set so as any other function on this watch and you can only set one but at least it’s loud enough to wake me up in the morning.\r\nTACHIMETER\r\nPersonally, I’ve never used a tachymeter on any watch. \r\nI think it’s more a decorative feature that always looks nice and it doesn’t hurt having. \r\nThe numbers are not just painted, but engraved in the stainless-steel chassis, so they shouldn’t fade away any time soon.\r\nRADIO CONTROLLED TIME\r\nTime sync is hit and miss, it won’t always work especially around electronic devices that can cause interference, which is hard to avoid these days. \r\nIn my room it works 50% of the time, but you might have a better chance of getting the signal especially if you’re facing south-east given that the source of the time signal is in Germany. \r\nEven then, without the sync it has an accuracy of 12 seconds per month which won’t be a good excuse to be late for your appointments.\r\nDon’t expect this watch to automatically sync the time everywhere in the world. In fact, it’s just programmed to receive the signal in four time zones in the USA and the UK. \r\nEven if the European antenna is in Germany and the signal can be received across the continent, if you leave the UK time zone you’ll have to set the watch to the “alternative time mode” and the radio-controlled sync won’t work. \r\nYou can still use the watch in any time zone but without automatic sync.\r\nLuckily, I’ve found a workaround for this issue: let’s say you decide to go to Spain for your holidays, which is +1Hs and you’ve set the watch to the A-TM mode. \r\nIf you’re really concerned about the accuracy of your timepiece, all you need to do is to set the watch to LON London time, do a manual sync and then switch back to A-TM. \r\nDuring these operations, the watch keeps the correct time and you won’t lose any seconds.\r\nSOLAR CHARGING\r\nWith this watch you’ll never have to change a battery again in theory. \r\nThe back is not even removable, it clearly says that only an authorised service centre should do that. \r\nI’ve been wearing it for two weeks now and still hasn’t reached full charge. \r\nI believe that the British winter and lack of sunshine is to blame, not the watch itself. It’s probably telling me that it’s time to book my next holiday somewhere like Spain…\r\nCONCLUSION\r\nI got this watch for around £250 which is a real bargain for what it offers and considering that on the high street you can find it for up to £400!\r\nEven if you won’t end up using all the functions of this watch, most of which are available on our much easier to use smartphones, the fact that I had to read a manual to learn how to operate it made me feel a bit nostalgic of a time when this was the norm. \r\nIt might be just me, but there’s a certain sense of fulfilment in learning out how to use complex tools, which it’s exactly what this watch is. I allowed my wife to buy me this watch for Christmas and for future use as a holiday watch.It looks good and fits well to my slender 6.5 wrist. However, it did take a long time to charge up, in fact far longer than any other solar powerd watch that I have. The radio signal isnt very effective either. I have a casio waveceptor which updates every night, but not this one - which Ive had to manually adjust and thats a task too hard for my feeble aged brain. As I only received the watch on Christmas Day and its now 27/12, its early days so it has time to redeem itself. Love it, been looking for the right watch for ages and now Ive found it. Its light but not flimsy, looks the business both for smart and casual. A real mans watch. Strap is very comfy and classic looking too. I bought this model AT4000-02E as a birthday gift for my husband a couple of years ago. He absolutely loved it. Unfortunately, he lost this one and we immediately replaced it the next day. This is his second AT4000-02E - thats how much he likes this watch. It has all the functions and features he requires: accurate, eco-friendly, and a great watch for travel. Although its a little thick, it still manages to look elegant not too chunky and the leather strap helps maintain the classy look of this watch. One slight niggle is the crown is a little difficult to get at and screw in to the case, but that really is it. This watch easily stands up to other watches costing three or four times as much, so great value for money. I have recommended this watch to several friends and colleagues. Watch was exactly as shown on the website, well presented. Whole experience is just what you want from online shopping, easy, efficient and quick. Cant fault the whole experience. Cannot review as this is a Xmas present and hasnt been given as yet. 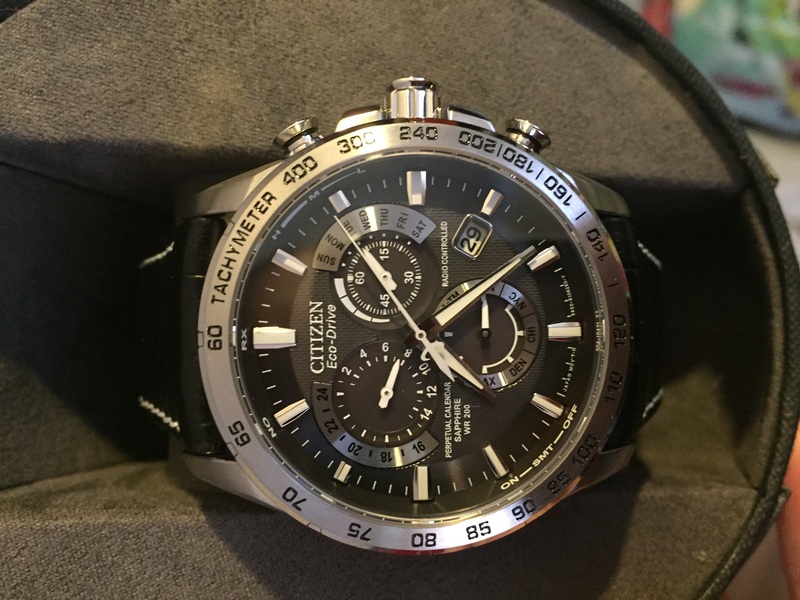 Im a big fan of Citizen Eco drives and have several in my collection. To have a watch that keeps perfect time, doesnt need battery changes and has a perpetual calendar, means that this attractive timepiece fulfils all of my needs from a watch. Whats not to like? Excellence watch.. the pictures cant do the justice unless you look at it in person. The leather is a bit stiff but it gets better in 2 or 3 days. Other than that no cons about this citizen watch. Very happy with this watch. I was after a watch that does not require a battery as the one I have at the moment has one and when the battery is replaced the water resistance is no longer of any value unless its sent away to be pressure tested. So I now have this outstanding watch which is eco drive so no worries about batteries running out. It was straight forward to set as its all done automatically . The instruction manual is very clear and easy to understand. Its great value and can be worn for any and all occasions. 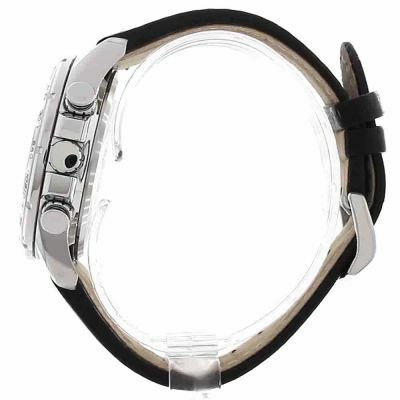 The leather strap is great quality and suits the watch.The face is very clear and easy to see. Purchased for my husband as a christmas gift - like the look of the watch so hopeful he will be just as smitten! The watch was bought for my son in law for his birthday. He thinks the watch is fantastic just what he wanted. He is impressed wth the look and feel of this watch and wears it with great pleasure. Very happy with the product. Good value for money and easy to use website. The only disappointing thing was the delivery time, next day delivery turned out to be 3 days with the order placed on a Thursday and arriving on a Monday. Beautiful watch. Great quality. Fast delivery. Do you want to buy a well crafted and functional watch, worth the price tag? 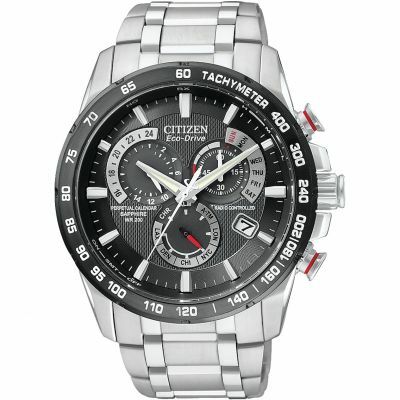 then get the Citizen chrono perpetual A-T alarm radio controlled watch. 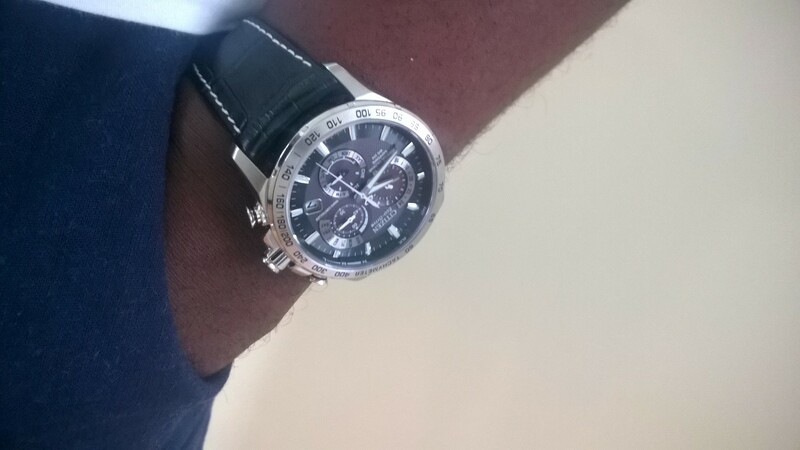 This watch is a sight to behold, it comes in a silver polished case, black face and metallic dials. The comfortable leather straps are black with contrasting white stitches on the edges, giving it a unique look. 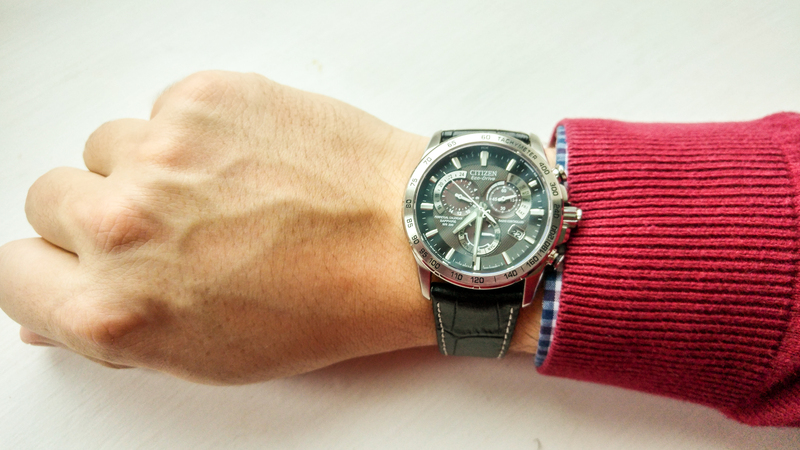 The watch 42mm is perfect for a medium sized wrist. It fits snugly and you dont feel any discomfort on the wrist, which tends to occur with some watches when the case tilts and impinges on the outer wrist bone. Also, the case is not so thick as to prevent your shirt sleeve from going over it. The dials are easy to read and the watch is very silent. I love the fact that i can set the alarm on this watch and also not bother about changing the date at the end of the month or the time when i travel to different time zones. Best of all, NO BATTERIES!!! and a 6 year warranty when you register online after purchase.The watch can be worn with casual outfits and formal wear, but this watch is so nice , you would want to wear it all the time. The face of the watch is a bit busy and you have to tilt it to see the indicators on the inner side of the watch face.....these i can live with. I recommend this watch if you are interested in looks and FUNCTION. It is worth the price!!! great looking time piece stylish and great price, enjoy wearing it. I have a collection of 12 watches this watch is by far and away my favourite,with this watch you set it and forget it for entire life of the watch [unless you change time zones].The look of this watch is stunning, it is the perfect size and says quiet confident class,it keeps time to the second thanks to its syncing with the atomic clock and eco-drive has to be the future for all watches.I did fit another strap to get the look that I was after [see photo]and I think the leather Nato strap is the bees knees but that is a personal thing.Overall I could not be more pleased with this watch,a very high end look and function for not a high end price tag.One very happy customer. Beautifully made and very stylish. Terrific watch all round. 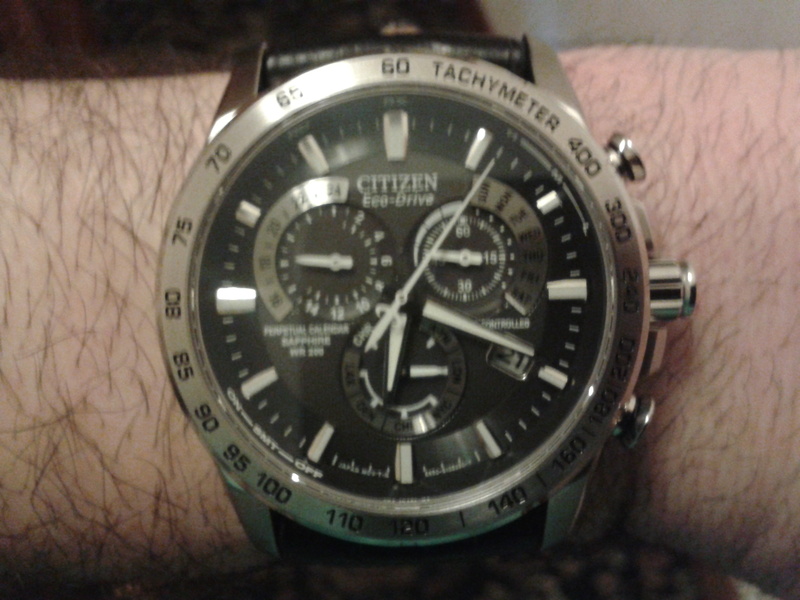 I have had the Citizen watch for only two weeks, however this has been long enough to check all the functions. I am amazed at the accuracy. it checks itself every night by radio signal and is accurate with the atomic clock. It also automatically sets the correct day and date at the end of every month and re-sets in spring and autumn for the time moving forward and back one hour. It charges its battery by solar cell so no changing batteries, currently it is showing full charge with normal wearing. So Im redundant, I can check the battery charge, yes done. I can check that a high quality radio signal was received last night, yes done, that is all I need to do unless I want to use one of the other functions. The lower small dial allows different time zones to be set, also alarm and chronograph. Set time zones are London, New York, Chicago, Denver and Los Angeles, so if you travel a lot in the USA you are catered for. Time zones other than these are set via the alternate time ATM setting by adding or taking away hours. One point here, when pulling the crown wheel out to its first position it is easy to pull it out to its second position by mistake, its quite a fine movement. The top left small dial is a 24hr clock so you know whether it is morning or afternoon, useful for shift workers who cannot see out, the top right dial tells you what day it is and is also used by the chronograph. The hands and hour markers are luminous and can be seen clearly in the dark. They are not radio active nowadays so you can safely wear your watch at night without sterilising yourself. Now, the mysterious Tachymeter with those strange numbers going round the outer rim of the watch, they look impressive but what are they for? A check on u-tube will explain but to give you an idea, I was an RAF pilot back in the 1960s before sat navs, computers, or even calculaters and if there was no room in the aircraft for a navigator then you did it yourself, often by Dead Reckoning . You planned the route using met information before take off, after which you where on your own, if wind speed and direction were not as planned which was often then you could end up lost, late or early at your destination and if it was a target then timing and accuracy was critical particularly for those friends on the ground. This is where a tachymeter can be useful. If you can identify an object en-route and take the time to another object of known distance, say one mile for simplicity then you can calculate your true groundspeed, the tachymeter does this for you. Start your chronograph at the first object, stop it at the second object and read off your speed on the tachymeter. For example, if the distance was one mile and the chronograph stopped at the 15sec position then you can read off 240mph. If the distance was 2 miles and the chrono stopped at the 40sec position you can read off 90 which you double because it was 2 miles then you have 180mph. I realize that these are simple examples but I hope you get the picture. Unfortunately the lovely Omega pilots watch provided by the RAF in those days did not have a tachymeter perimeter nor a chronograph so mental arithmetic was necessary or the Dead in Dead Reckoning could become reality. So I finally have the ultimate watch, unfortunately I am now an old fart who does not fly and my car has a sat nav which is worse at navigating than I am. I hope this helps someone with an old aircraft someday when their I-phone sat nav app battery dies mid air and they are wearing this watch and remember my instructions, if not, at least if they crash into the sea and it is less than 200m deep then the watch should still be going when their body is recovered. By the way, the watch looks fantastic, is comfortable to wear and you look like a real pilot with it. Fabulous watch! aesthetically pleasing, practical, comfortable and has a good weight to it. Very happy I bought this. Worn it every day and will continue to do do. Excellent website, easy to navigate and tools to enable you to find the perfect watch for you. Quick delivery too. Only criticism is the watch strap is on the small side and I would have liked a reminder to appear in the ordering process to measure my wrist and make sure the watch strap is the right size. Very nice watch at a very reasonable price. Bought thus with another watch for my wife and was informed at the checkout that there was another 20% off! Then informed that I had more money off from points I had gained from a previous purchase - result!! As always great service and delivery! Excellent watch. Fits lovely and very comfortable to wear. Great design with excellent features. Very happy with this purchase. Will defiantly recommend this watch to others! This black-faced chrome cased beauty tells the time very accurately, with the radio-controlled uplink at 2.00 a.m. each day keeping it just so and manual override is available too. Being solar powered it should keep working for the foreseeable future without human intervention being required. The perpetual calendar with day indicator and date window is very helpful, there is an alarm function to go with the three button chronograph capability and a tachymeter bezel for those who like to indulge in mental arithmetic! All the functions and settings are adequately described in the owners handbook but do remember to give yourself enough time to become familiar with the operations though. 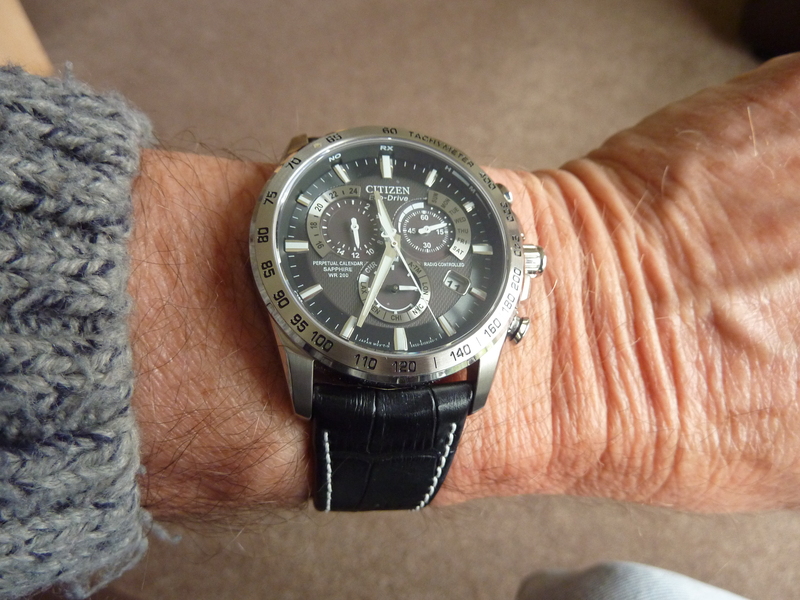 The real leather strap in black with contrasting white stitching feels good and is just about ok on my wrist, but will be more than adequate for the slighter built person....and the watch has luminous batons and hands, so finding it in a dark room is easy too. All-in-all a lovely, attractive timepiece that will enhance the wrist every time it is worn. A really nice looking watch for the price, at home with business as well as casual wear. Nice big clear dial which does not feel too fussy or cluttered with the smaller rear dials, and does not make it feel like a chunky complex aviator or divers watch, of which it is neither. In fact the face nicely fills the dial with the bezel not encroaching to much onto the size of the face. Some have said it is a little complicated to set up. Frankly if you live within the range of the transmitters then it pretty much sets itself up. Yes you do need to read the instructions to understand some of the less obvious functionality like how it indicates power levels and how strong the reception is but this is pretty straight forward. The Eco drive combined with the radio control is an exceptional combination, making this a unique watch and well worth the money. I understand why this clock is a best seller. I love it. It has everything I expected. The only downside is that in eastern Europe it has no Radiocontroled time zone. All the other features are as expected. Thanks Watchshop. Bought this watch on a bit of a whim, looked very nice in the pictures and other reviews of the watch and brand came up well. Not disappointed at all, not only a great looking watch but very well made and packed full of more features than I will ever use. A Great looking watch, very masculine without being too overpowering and certainly catches the eye when out and about. The contrast of black face/silver bezel and white markers really catch the eye and make it look far more exclusive than it actually is. I have several more expensive watches from Tag Heuer and Tissot and this sits up there with them in terms of build quality and style. Its equally suitable for both everyday or formal use. Some great technical features with this watch, most of which i will probably never use, but having had a good play they all seem to work exactly as described and the supplied instruction guide is better than most to help you get to grips with it. The only negative I could find, is that strap is not over large and anybody with a large wrist may struggle but for me it was fine. I would highly recommend this watch to anybody thinking of buying it. 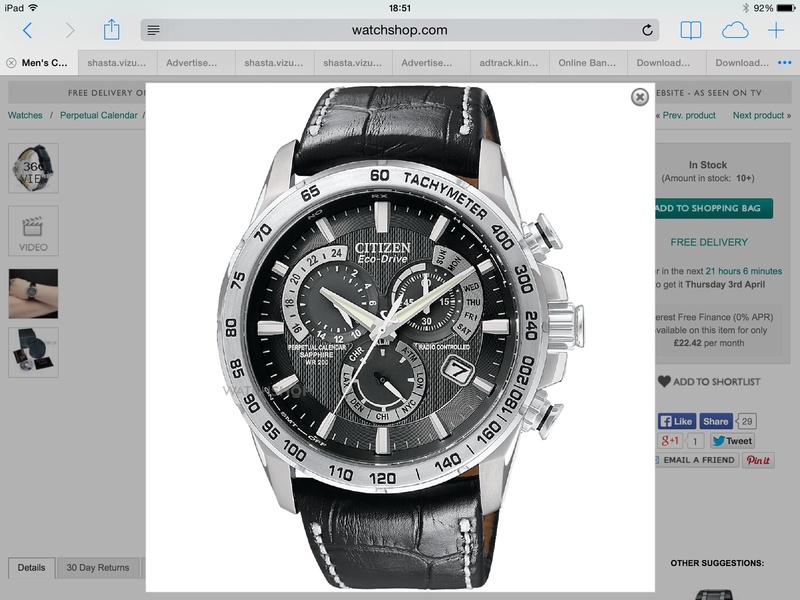 WatchShop service was excellent with next day delivery and tracking information down to 30 mins. Will definitely be returning for my next purchase. This was a really quick delivery. pretty much next day. I have bought this for my dads 50th birthday. I absolutely love it and Im sure he will too. really smart looking watch and not too chunky or big. 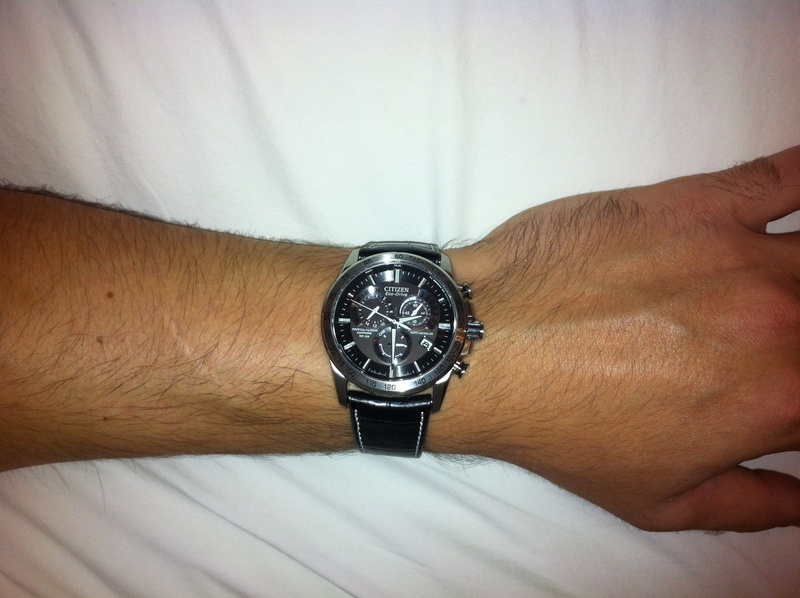 A really manly mans watch. Definitely recommend it. Incredible looking watch, looks even better in person that in pictures. Great build quality and workmanship. Very eye-catching design and can be worn both casual and smart without looking out of place. Loads of great features and automatically changes for the clocks going back and forward so you need not worry about forgetting. Overall a great purchase and would definitely recommend, especially for the price! Loving the watch. Superb array of features and looks fantastic. Plus the support from watchshop is excellent. Had problems with another watch I was ordering before this one and watchshops support team were on hand immediately to remedy the problem. I will definitely come back to watchshop again for my next watch simply because of their great support. had the watch for several weeks. i have owned brietling/tag/seiko etc. this is the most attractive and practical watch i have had. looks and feels way beyond its price. Overall, a great timepiece. Love this watch it just looks amazing. Everything about it oozes quality and refinement at an excellent price. looks plain old fashioned and out of place - not so here. official product photos. Its a very small price to pay for the Eco-Drive technology. Overall superb value, well deserving of a place in any collection. This is a beautiful watch. I gauge the quality of a Quartz movement by the ability of the second hand to hit all its markers. This one does that perfectly so the level of watchmaking and assembly during manufacture is plain to see. Solar and atomic time receiving makes this a great pick up and go watch. It looks great on the wrist without looking too flashy - its subtle yet stand out looks always gets it noticed. I am super pleased with this watch and have no issue recommending it and Watch Shop if this model is in your sights. This one is going to get a lot of wrist time. Very, very pleased with the watch, it,s the second watch I have obtained from you and in both cases I have more than pleased with them. The watch is exactly as described great bit if kit. Service spot on really pleased with my purchase. 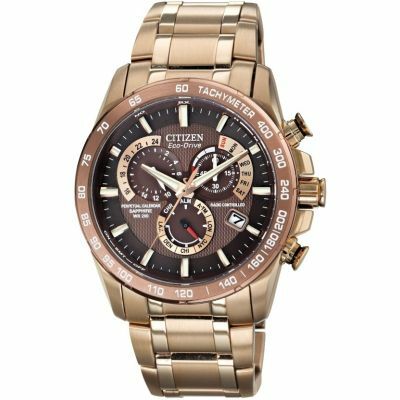 Great quality looking timepiece, Im a big fan of Citizen Eco drive, spot on timekeeper as you would expect from a class product. I love complaining about shortcomings in things I purchase so I really hate this watch: As a lot of people have already stated it looks better in real life than any picture. When I opened the box the watch was doing the two second thing so I sat it at a window and after 75 minutes it was working normally. I read all the instructions and fiddled about with the buttons for a while and soon got the hang of it. The watch is wonderful - no complaints at all - I really like the lay-out and the perpetual calendar. I found the best place in the house for radio reception and put it there every night - I check it every morning and it is right to the second. Anyone wanting a good looking accurate watch at a reasonable price look no further than this one - one of my better purchases and I highly recommend it and watch shop for their quick service - I like the way Watch Shop let you track your order from square one so you know precisely what is happening all the way to delivery. Love my purchase and am very happy with the service! Definitely recommend using this site! Very pleased with this. Exactly what I wanted. Its easy to read and comfortable to wear, the leather strap ideally suited to my small wrist. Excellent value for money. Excellent watch. Perfect in size and not to big. Flashy yet discret. You cant fail with this watch - and it won´t fail you since its radio controlled. Need to worry about battery. I love this watch. Excellent product and services. I was looking for a semi casual watch from a long time and i found this watch. The product really suits to a frequent traveller requirements. Information provided on this website is in such large details that i was not even able to find such information on product website. Really happy with the product and services . Would definitely recommend it to others. 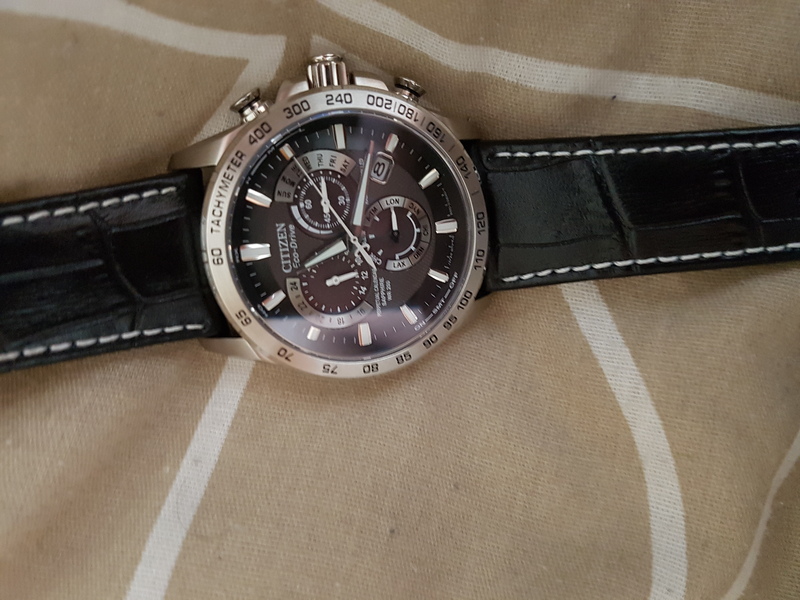 i am very pleased with the citizen watch i received today,this is the 3rd citizen i have owned but this is the newest and best,the thing i liked the most is because its radio controlled and eco drive of course which is much better for the environment,alarm,chronograph, tachymeter,automatic calendar,what more could i ask for,it has a very solid feel to it and it fits perfectly on my wrist,love the colour looks classy,there is nothing to fault about this watch and i definately be buying another citizen in the future. Very good product. Very fast delivery. Good finance option. Very happy to deal with the seller. I had some requirements when I started looking. Radio Controlled, Sapphire Glass, Perpetual Calendar, Chronograph, reasonable Water Resistance and Solar Powered. That narrowed my chooses, and this watch was one of the few that ticked all the boxes. Ive had it for over a week now, and am very, very pleased with it. 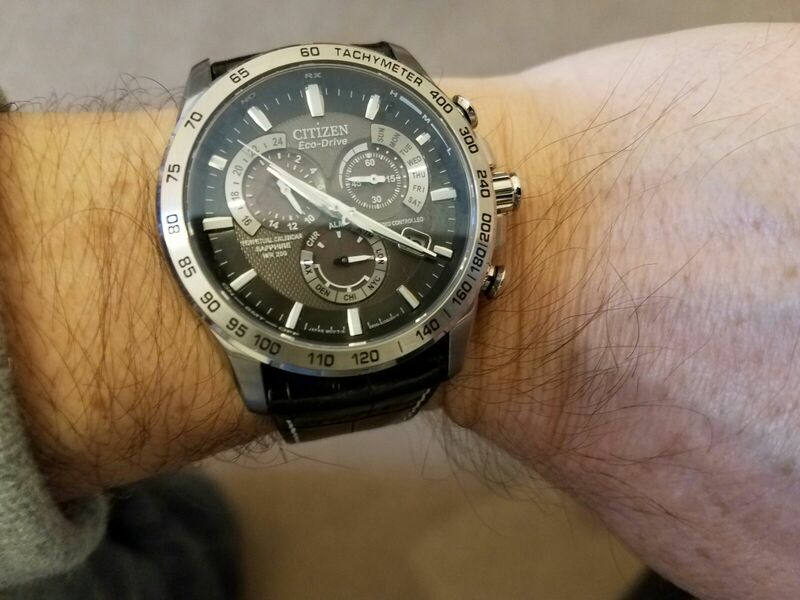 It looks and feels like a quality timepiece as you would expect from Citizen in this price range although slightly heavy, but in a good way which suggests decent build quality. Its quite large but doesnt look odd on your wrist and the buttons have a good feel to them. Ive had a fiddle with all the radio control, stopwatch and alarm modes, and although I had to read the fine manual, it was all pretty easy to use. The alarm is on the quiet side, but I gather that most if not all watches like this have a similar problem. I think it would wake me up if it was beside me on a bedside table. For anyone wanting the radio control functionality but not being in Londons time zone but within range of the transmitter in Germany, this can be achieved by setting the reference 0 position. Its in the manual. Theres also alternate time, which is not radio controlled. I prefer this black leather strap version over the metal bracelet ones. The leather strap is quite thick and looks and feels well made. It soon bent in all the right places to fit around my wrist in my oppinion a very comfortable watch to wear. An excellent watch for people working night shifts that require a personal Alternative PM Time reference. I can now keep track of Breakfast, Dinner and Tea time at the touch of a button. It looks stunning as well. Many Thanks Watch Shop for fast delivery. Really pleased with my purchase, watch looks like one costing 5 times as much! Really classy time piece and well with the money! Got this watch this morning ordered yesterday afternoon! and I am very, very happy with my purchase. What a stunning watch, nice size, nice weight, nice finish, looks so much better in the flesh and really does look and feel like a watch costing a couple of grand! I love the fact that it has a sapphire crystal usually only found on Rolex and the like and it is waterproof to 200m! I went for the leather strap version because I have thin wrists and I think leather looks more tasteful on people with thin wrists. All in all this is a really fantastic time piece and you get an awful lot of watch for your money! Highly recommend using the watch shop. You get what it says on the tin and I was most impressed with the super fast Saturday next day delivery - even though I placed the order just minutes before the cut off point. Great service guys - keep it up. Great watch, everything I wanted and more. The sapphire glass hasnt got a scratch on it - and as its heavier than my previous watches I have dropped it several times. It is worth mentioning the bezel can get dinged though - but as the glass is still perfect well worth it! Every thing I expected of a good timepiece ,so pleased with the watch,looks great a real great looking watch ,smart and easy to use thanks to the DVD that ce with it. Excellent product description , good pictures , makes it much easier to decide . The delivery service was spot on. Well pleased with watch. Only very minor criticism of watch is the crown operation. The tolerance between crown-- intermediate and fully extended positions takes a bit of practiceespecially for alarm setting. Easy to move from inter setting to fully extended position without realising and visa- versa. Alarm a bit on quiet side. CD Rom instructions also a bit poor bearing in mind watch costs as the watch shown doesnt match purchased watch. However booklet instructions helpful even though crown operation types shown are a bit confusing. Do you twist or click? Which version is for my watch was my first puzzle! Overall though well pleased. Couldnt have picked a better watch than this one! Looks awsome and cant fault the quality or features. I was very pleased with this watch and even more impressed with the service I received six months later when the watch developed a fault with condensation inside the face. This was handled with first class customer service. The watch shop sent a return courier bag so I didnt have to worry about postage. The watch was repaired and returned to me working in as new condition. I have never seen better service from an online shop and will use the Watchshop whenever I want a new watch again. After shopping around for a new watch, I have found an ideal replacement for my 10 yr old Seiko Kinetic. I have only had it for approx 2 weeks but it is an impressive timepiece, it looks great never misses a beat and with day, 24hr and the perpetual calendar features, what more can you ask for?? At the price Citizen have delivered, if you are thinking of buying one dont hesitate, you wont be disappointed. Excellent watch. Instructons seem a little complicated at first - but with a complex mechanism like this, necessarily so. So far it has done everything asked of it. i would recommend it, together with the admirable service provided by Watcshop! This watch was bought as a christmas present for my twin brother. 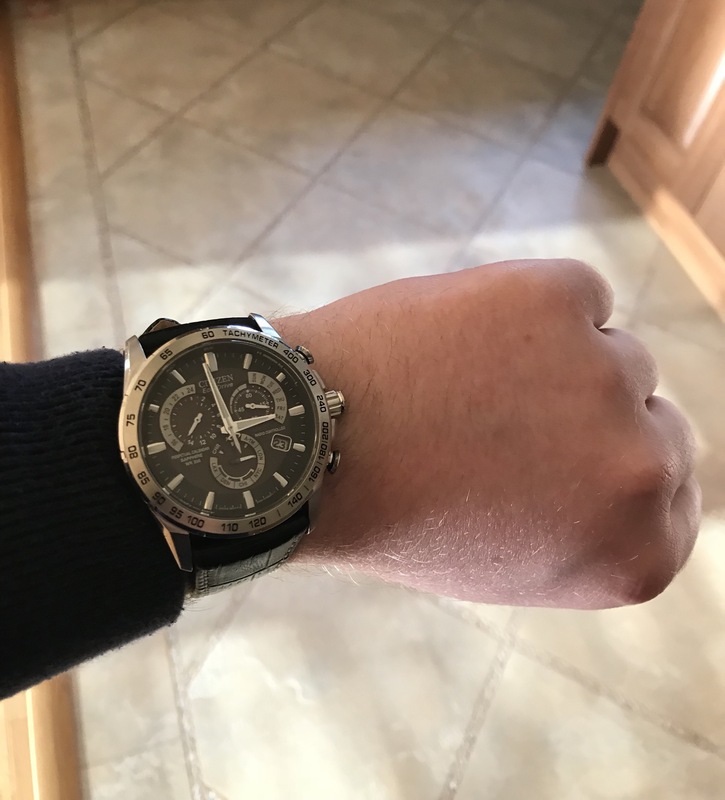 I have been very pooly and he has been very surportive these last few years, i wanted a good watch that looked good with a suit and stylish in casual wear, this watch does both. It mixes the classic and moden look and the styling will stand the test of time. if i were to buy a watch for myself i would not hesitate in buying a Eco-Drive AT4000-02E, it would make me smile every time i looked at it. 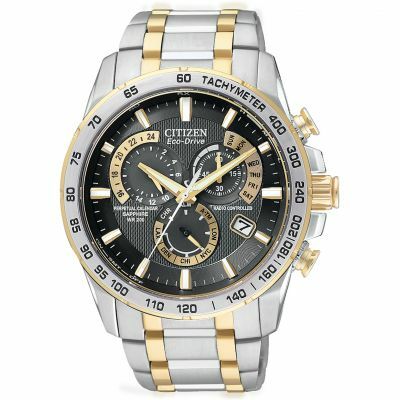 First of all, Ive never had citizen before, but I completly satisfied with it! When I saw this watch first, I tought that is just my style, and compare to the others, looking much better for me. 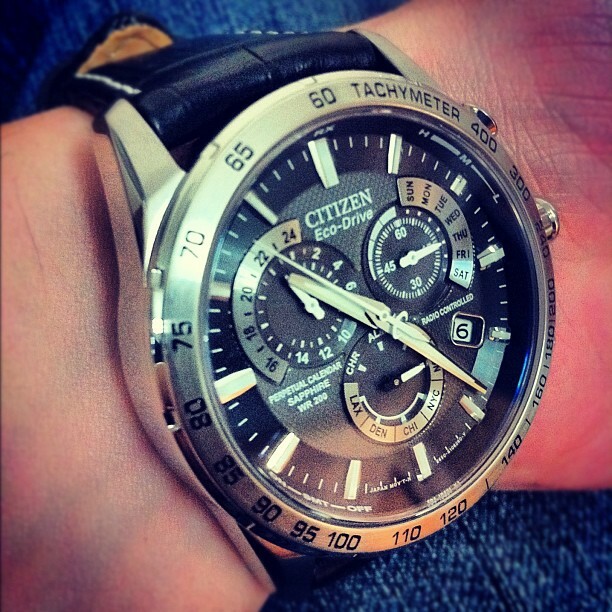 There is some cheaper citizen in the market, but I think this one just worth the price 299£! About the features: this watch receives radio signals, which mean you do not need to set up the time, which is great! Eco drive, so you do not need battery at all, as it charge itself with any source of light! If you wear it on regular basis,then do not worry about charging, but if you dont, then make sure you dont keep the wach in the dark for more then 6 months! But I can not imagine to keep it in box for over 6 months without using it! It is too nice not to wear it! City selection function, is great if you travel, but if your city is not listed, you can set up an alternate time zone as well! Also has chronograph function, alarm, and perpetual calendar that eliminates the need to correct the date at the end of each month! You can check the power reserve and radio signal reception just to press a button! It comes with 5 year guarantee. So as I said that is my best watch ever, and I highly recommend it! Thank you! Its a brilliant watch, no need to say. Elegant, easy to understand you dont want to spend 5 finding out whats the current time! and stuffed with useful features. The radio-controlled feature removes the hassle of re-setting the watch when travelling - similarly the perpetual calendar is great I know for certain without it, I will be looking at the wrong date every odd month. 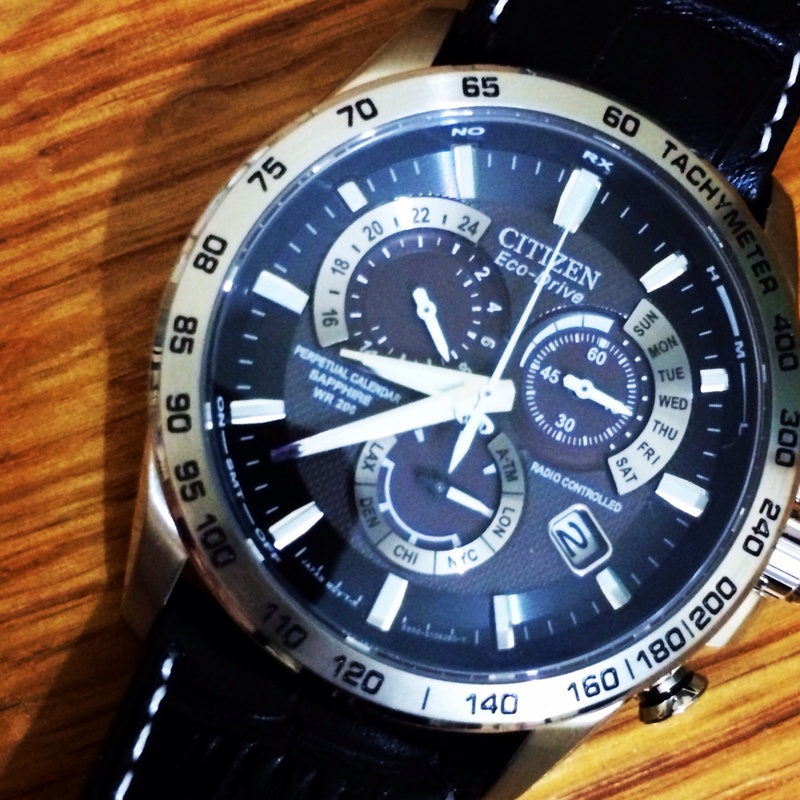 The quality and the making of the watch is what you would expect from Citizen. It is sturdy but not overly heavy, it looks prominent but not too big maybe larger men will prefer bolder watches, I am rather slim. My only observation is that the leather strap does look a bit flimsy, and I can see it needing a replacement some time down the line. I believe that it is an excelent watch, especially considering the price range. 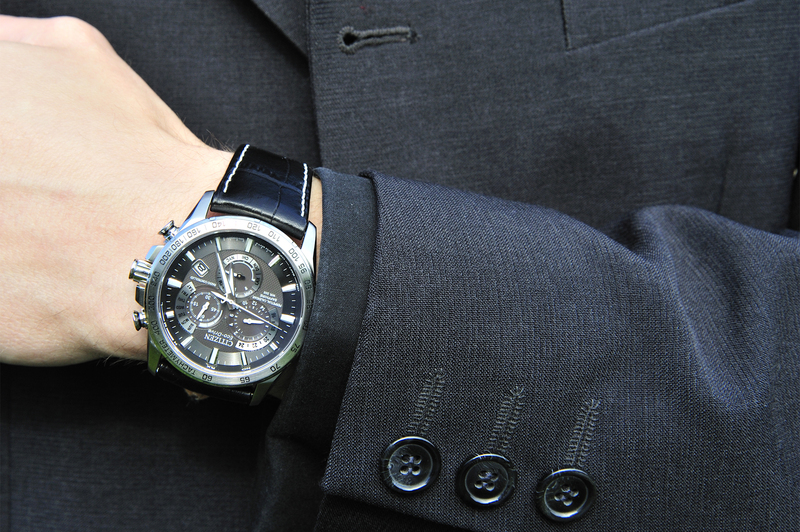 Great looking watch, smart, solid, for smartening up appearance at work. Makes a change from the usual pricey brands people wear. To put it simply this is a lovely watch. It looks and feels like it should cost a lot more than it does. I havent worn a watch regularly for 12 or so years so I was a little worried that it would feel heavy and ungainly but after a days wear I didnt notice it - thats when I wasnt looking at it. Its a very elegant piece of design and I found I got used to the layout very quickly. Im yet to use the alarm function so I couldnt comment on how logical it is to use. Im very pleased with it and happy to recommend it to others. A very smart time piece. Beautifully put together and very light. I hadnt worn a watch for 12 or so years and I was a bit worried that I wouldnt find it comfortable and that being quite a large diameter it would look a bit overbearing .Those fears were unfounded, as after 2 days I barely notice its there. Mind you I do check the time a lot now as it is such a great piece of design. Each time I look at it I spot another little detail. It certainly looks and feels like its worth a lot more than the asking price. I havent tried setting the alarm yet so I couldnt comment on functions such as that but everything else seems pretty logical once youve read the manual. Top marks. I dont think youll be disappointed. The watch looks excellent, it is a bit heavier than I had imagined but I soon got used to it. The alarm is a little quiet but I am a light sleeper so it should be OK. Never having to replace batteries is a very good feature and the radio transmission works a treat. Altogether highly recommended. Watch was as described in the info. Received promptly and already set to correct time and location. Bit of weight to the watch but after 20-30 mins not noticed. Setting alarm time on watch bit difficult but after watching the CD a few times it sunk in. Would recommend watch to others as so far no issues. I bought this watch as a replacement for a watch that my husband loved and our new puppy destroyed! It needed to be durable obviously, responsive to different time zones works between Holland/USA/UK, green solar powered, easy to use, comfortable to wear, leather strap, scratch resistant face and above all, stylish. This ticked all of the boxes and the price was competitive too but the look was not that great. However, when it arrived it was brilliant! It looked far far better than the images, and it functionality was amazing. My husband has said that its the best watch hes ever had and the time zone thing works - such a life saver for a frequent traveller. Oh and not to forget the alarm feature - truly excellent! Very good looking watch. It has a real quality feel with excellent features. Im definitely very pleased with this watch. Timely delivered and elegantly boxed. When I first took it out the battery was charged, the timepiece was holding correct time, the only thing for me to do was to put on my wrist – brilliant! It is radio controlled and sun powered – poetry in motion and exactly what I have been looking for! I thought it may be too bulky, but it is the perfect size and even though I do not like this type of shiny leather straps this element too is made in such a way that the only thing you can do is admire. The precision of the design is immaculate and impressive – I love looking at it from a close distance to appreciate all the details. I still have no idea how to set the alarm, but only because I have not read the manual yet, but, for time being, I do not mind – I am so happy to have it right now. It is the first gadget I have bought ever which does exactly what I expect it to without any hassle, and I look awesome wearing it, both in suit and in shorts! Looks as good as expected. Solidly built and very manly. Perfect diameter for my wrist size. A bit thicker than expected though. The radio reception is always high when it sets. Keep hold of the instructions booklet, its not that intuitive to use. This watch is very good. At first I had some problems with changing the time, but when you know how to do it its very easy. Im only 15 years old, so I dont have much experience with watches. According to what my father said its a good watch. The watch is very leight I cant even feel it anymore so thats a good thing. I dont think that there is another watch wich is better than this watch. So if youre considering whether youll choose it or not, I would like to say that this is a good watch. With all the functionality that is built in to this watch you get a very nice watch that looks the part, I have very few complaints about it, and It is not too difficult learn how to use it. There is a slight learning curve but its really not that hard to pick up how it works. I cannot say that there is really anything I do not like about it, the only element I would change about it if I could is that I would reduce the size of the function dial but that is such a small and insignificant niggle it is hardly worth mentioning. I am used to a slimmer watch, however I have not found this watch to be overly heavy or obtrusive and the leather strap in my opinion really suits the overall look and feel of the watch, to be honest I feel that overall the dimensions of the watch are really great and overall in perfect proportion. The fact that this has a perpetual calendar is really useful, I have had really nice watches in the past but the fact that you need to remember to move it on a day at the end of a 30 day month was really annoying, this watch will do all that for me. I can also see the day and date, that is a great fact, I have other watches where you have a date dial making it tricky to actually see the current date. I have already tested the atomic clock synchronisation in London, Madrid and Ecuador and can report that this works flawlessly. These are all small plus points but together add up to a watch that is really a great. I have yet to test the alarm, but I am sure that when I do I will not be disappointed. Overall I would say that this is a great watch, looks good with either casual or business attire, and is a really useful tool for any regular travellers. I must say that I am also really impressed with the service I received from the Watchshop, the item came on time, the communications were great and the packaging was secure. Would definitely use again for other purchases. 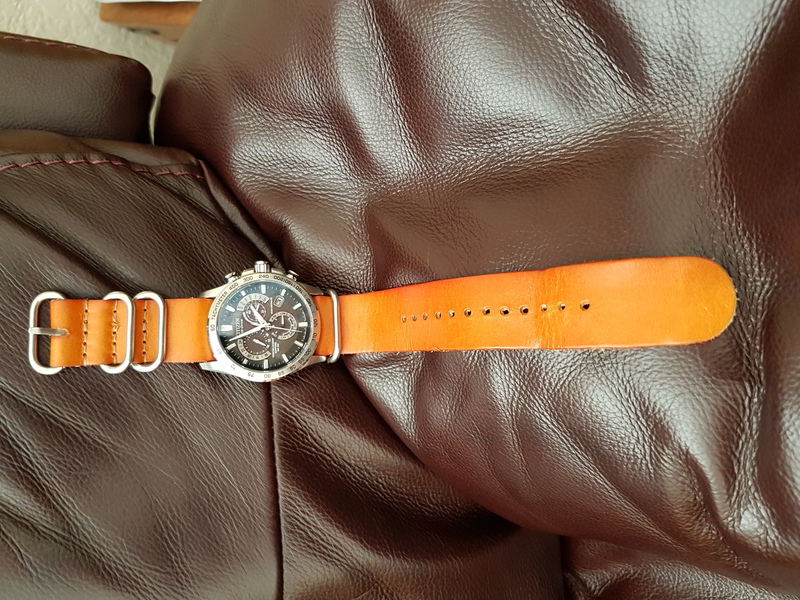 I have attached a picture of the watch to give a general idea on proportions but due to the fact this was taken on a phone I am afraid it is not of the best quality. This is a fantastic and very classy expensive looking timepiece! I love the radio controlled timekeeping you never have to adjust the time/date again! The strap is a lovely black leather with white stitching. It has so many features and comes with a sofware cd to help understand them all. I waited quite some time to purchase this watch due to the stock but it was worth the wait. Ive been using this watch for a month now and this is about the best one Ive ever seen.I love the Eco-Drive - after charging the batery during the first couple of days it constantly stays on full charge and it will go like tht for months! Very high-tech, build quality is second to none, looks impressive and much more expensive that it really is. Fits nicely on the wrist and complements well any dress style. Feels very solid, reliable and masculine and says that you know and care about watches! Peffect for people who want to get the latest technology and fantastic functionality without compomising the style. If you need a watch that has it all and is great for any situation, dont look any further. Best quality/price ratio! Good quality feel to it and good looking watch. Face can be a little busy looking for me but overall good value for money. Superb looking watch. Set it and leave it, not missed a second! Prefered leather strap to metal, only personal preference. Excellent quality. What a great timepiece. High quality all around. For the price, this is well worth it. I am a watch collector and have timepieces ranging from Rolex and Breitling. The great advantage of this watch is that it never needs a battery or to be wound and is always accurate due to the radio control feature. A great addition to my range. I am a professional pilot by trade and accuracy is very important to me. The sapphire face means it doesn't get scratched when wearing everyday like more expensive eco drive watches in the range. My only point would be an option for a steel braclet option as well as the leather one for this particular model. The watch is also light weight and not too big for an average size of wrist. The sophisticated appearance and clear face, with stop watch feature, means that I can wear it equally in the cockpit or for a night out. I thouroughly recommend this watch for the modern man, for value, reliability and looks. Gorgeous watch. Solid all around. Perfect wear for work as smart is always required. Very happy with the watch. Look and feel of both watch and strap better than it appears online. Metal parts nicely finished and face well detailed. I have a smaller wrist and while it is a chunky watch it still sits comfortably and doesnt look out of place. Having manually tested the radio controlled time setting I can confirm it works perfectly and its entertaining to see the hands travel round without your input! I really would give it 10/10 - hard to see why I would buy another watch in future. absolutely over the moon with this watch that my wife gave me as a surprise gift at 12.01a.m.on christmas day.The black face is SO attractive and stylish,large so everyone notices it and full of gorgeous gadgets!Only slight drawback was that the voluptuous top-quality leather strap was a bit tight on my wrist,not too tight(I had a couple more hole options)but there was no extra to 'play with'.But then,it meant that there was no excess to get caught on anything or wear out.I LOVE it!And after shopping everywhere for it,it was the cheapest price anywhere.Thankyou watchshop! Great service from watch shop, delivered next day and the cheapest price I could find! Really happy with the watch looks the part and got lots of features. superb looking watch looks far more expensive than what it actually cost,which wasn't cheap.easy to work ,looked at loads of black chrono watches before picking this one,glad i did. The product is a Christmas pressie, so wont know how well it works until Christmas. Really love the look and style of this watch - not too cluttered, and especially like the brushed metal parts. Simple to operate, feels solid and well made, my only minor complaint would be that the bezel is a little too polished and so not always so easy to pull out. All round great watch in every other respect though, I'm really pleased with it.